Olsen’s friend and fellow veteran Aaron Hinde was at the Occupy San Francisco General Assembly when he heard that a veteran had been critically injured in Oakland. When he realized it could be Olsen, whom he described as “one of the nicest and warmest people I’ve met in a while,” he and organizers from the Civilian-Soldier Alliance began calling local hospitals until they found Olsen at Highland Hospital in Oakland. Hinde, 29, served in Iraq with the 101st Airborne Division in 2003, told me that two off-duty EMTs who had been participating in the protests were said to have dropped Olsen off at the hospital. 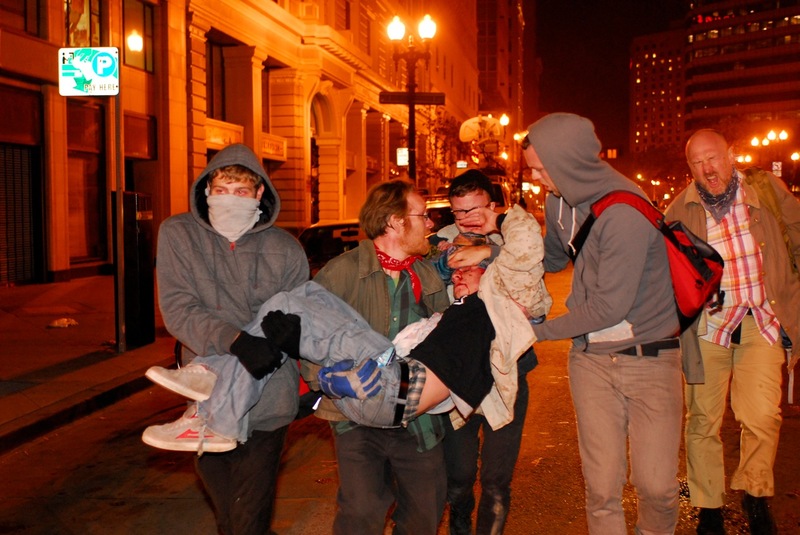 Graphic footage of Olsen’s injuries spread quickly around the Internet; the second high-profile story of veteran participation in the “Occupy Movement”. Last week, a video of a fellow former Marine chastising a line of cops in New York for beating unarmed, peaceful people went viral. The image of the 24 year-old with his camouflage jacket being carried bleeding through the streets by frightened strangers may well be one that is remembered for decades as a snapshot of this moment in time. Unfortunately, Olsen is not the first Iraq veteran to sustain potentially life-threatening injuries from a police attack while peacefully demonstrating. In 2008, former Sergeant Nick Morgan was crushed by a police horse in New York as veterans and allies protested the Iraq-war and the treatment of veterans outside of the presidential debates. Morgan, who served in Iraq from 2004-2005 with the 1st Cavalry Division, was peacefully demonstrating outside of Hofstra University when Nassau County police attacked the crowd with horses and batons. As he was pulled to the ground, a police horse’s hind legs came down on Morgan’s face, crushing his cheekbone and orbital, breaking his nose, and giving him a concussion. Police pushed those trying to protect him away and dragged him unconscious across a large intersection where he was arrested. A week after the attack, Morgan underwent surgery to keep his eye from sliding into his sinus cavity and to hold the shattered bones in his face together. Absorbable plates were inserted under his right eye to reconstruct his shattered lower orbit and a titanium plate remains screwed across his cheekbone. For over a year his vision was impeded until a second surgery removed the scar tissue that was causing the complications. Similar to the police attack on Morgan, when a crowd rushed to aid Olsen after he was knocked to the ground on Tuesday, a police officer lobbed a Concussion grenade into the crowd to disperse them, possibly furthering Olsen’s injuries. Indeed, there is a special sense of betrayal that veterans experiences when they realize that the political system they risked their life defending is prepared and willing to attack them for voicing opposition to its policies. In a press release sent out Wednesday, Iraq Veterans Against the War condemned the attack on Olsen and the Occupy Oakland march: “It’s ironic that days after Obama’s announcement of the end of the Iraq War, Scott faced a veritable war zone in the streets of Oakland last night.” The organization has also established a fund for Olsen’s recovery. Morgan filed a lawsuit against the Nassua county police in 2009 for violations of his 1st, 4th, 5th, and 14th amendments rights, as well as a litany of New York State and civil rights, and he is currently awaiting a January conference to set a trial date. The Nassau County Police Department has refused to settle out of court. Later, the Occupy Oakland general assembly voted 1607 to 46, with 77 abstentions, to call for a general strike of workers and students next Wednesday, November 2nd. Cities around the world are planning solidarity events as well.